In ancient times Licorice was used by Egyptians as a beverage and a pharmaceutical. Licorice root, or sweet root, can help to keep your lungs clear, your digestive tract calm, your colon cleansed and your adrenal gland functioning properly. It has also been known to be a reliable and pleasant way to soothe a sore throat. In herbal medicine, it was used to treat skin disease, coughs, colds, bronchitis, eye conditions and hair loss. Licorice extract has been determined to contain anti-viral properties and has been used to treat the viral family of herpes such as chicken pox, shingles, genital or labial herpes, shingles and cold sores. Modern herbalists use Licorice to sustain adrenal function and treat adrenal insufficiencies, including hypoglycemia and Addison's disease. It is also used to purify the liver, helping in the defense against liver disease, such as cirrhosis and hepatitis (under a physician's care). Licorice root contains anti-depressant compounds and is an excellent alternative medicine to St. John's wort. Its aspirin-like action is helpful in relieving fever and soothing the pain of headaches. The phytoestrogens have a mild estrogenic effect, making it useful in treating menstrual pain and the symptoms of PMS and menopause. It has also been used to lessen the symptoms of chronic fatigue syndrome (CFS), and fibromyalgia. For thousands of years, Licorice Root has been used as a superior expectorant that is primarily used for respiratory problems. The herb helps loosen phlegm and ease congestion and cough by helping to loosen and thin mucus in the airways. It is believed that the herbal tincture can fight viruses that cause respiratory illness and an overproduction of mucus in the body. Its active constituents may help to soothe and coat irritated respiratory tracts, while the anti-viral properties may help to shorten the duration of upper-respiratory infection. Additionally, the UMMC has acknowledged that the use of Licorice extract's traditional use for asthma may hold merit for this use. Its anti-allergenic effect is found to be very useful for hay fever, allergic rhinitis, conjunctivitis and bronchial asthma. Estrogenic compounds are also active components of Licorice extracts. The compounds dianethole, anethole, and photoanethole. These enhance the production and release of the reproductive hormones, like estrogen, progesterone, and prolactin. Illness is sometimes related to these hormones, such as polycystic ovarian syndrome. The herb may be potentially useful for the treatment of menstrual abnormalities, or PMS, with bloating, nausea, menstrual cramps, irritability and breast tenderness. It has been found to have some success in the treatment of menopause symptoms, including exhaustion, mood swings and hot flashes, by helping to balance the hormones in the body. Most women experience a yeast infection at one time or another caused by Candida albicans. Licorice root extracts have shown to be effective for the treatment of this and other yeast infections. There has been some research done that shows the benefits of Glycyrrhizic acid, contained in Licorice root, which may help with nervousness and depression by encouraging the function of the adrenal glands. Our adrenal glands control the stress hormones, including cortisol. When the stress hormone levels are low it can often be a cause for melancholy, persistent fatigue, anxiety and you may have less of a resistance to infections and disease. Licorice also happens to have the Asparagine amino acid that needs to preserve the equilibrium of the body's nervous system. 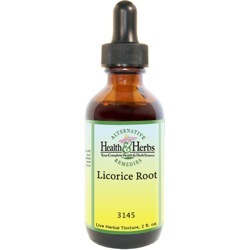 Licorice is a great support for good digestion and healthy gastrointestinal system. As a demulcent, it soothes the mucous membranes and protects the stomach and intestines. It has been known to coat the stomach's lining with a mucus, rather than restraining the secretion of gastric acid and reduce the activity of pepsin. Deglycyrrhizinated licorice may fight ulcers as effectively as prescription drugs when it is combined with antacids, according to the UMMC. Licorice may also help to protect those who are taking aspirin from stomach ulcers, as aspirin tend to irritate the lining of the digestive tract and may contribute to this condition. This herb may also protect the colon and has been used in herbal medicine to treat ulcerative colitis, Crohn's disease, celiac disease and gastritis. Licorice is an old, mild laxative that is also known to cleanse the colon. This herb has a cleansing stimulant that is effective in removing toxins and wastes from the body. Research shows that Licorice root may control the cholesterol levels by enhancing the body's flow of bile. It also has an anti-oxidant action that may enhance capillary health and hinder the growth of arterial plaque. A study found that people who take up to 900 mg of Licorice flavonoid for 8 weeks showed a remarkable decrease in body fat, body weight, LDL cholesterol levels and body mass index. However, people who take more than 20 g/day, may raise blood levels of the hormone aldosterone, which can cause serious side effects such as a headache, heart problems, and high blood pressure. An antiviral, Licorice has been utilized by modern herbalists to combat viruses, including herpes simplex, sores, and shingles. Several studies have shown that the anti-viral action of Licorice root extract may suppress the return and progression of cold sores due to the herpes virus. When applied in an oil or salve, it may relieve symptoms of itching, redness, and swelling of lesions. Several different pastes, creams, and gels are made with Licorice extract to treat psoriasis, eczema, skin rashes and itchy, dry skin. A small medical study has shown that the demulcent and anti-inflammatory agents in the herbal extract of Licorice may decrease the signs of atopic dermatitis (eczema). For age spots use ½ a lemon. 2 Tbls sugar, 2 Tbls. Olive Oil & 2 drops Licorice root extract. Massage 10 minutes on the skin for age spots. Therapeutic actions: Demulcent; Expectorant; Emollient; Pectoral; laxative; softens stool without purging. Aperient; Stimulant; Sialagogue. Nutrients: Biotin, calcium, choline, iron, lecithin, magnesium, manganese, pantothenic acid, phosphorus, potassium, selenium, silicon, zinc, vitamins A, B1, B2, B3, C, and E.
Drug interactions: Interacts with Digoxin, loop diuretics, Thiazide diuretics. Supports those taking Aspirin, Etodolac, Ibuprofen, Interferon, Isoniazid, Nabumetone, Naproxen and topical corticosteroids. CAUTION: Do not use if have cirrhosis of the liver. Large and frequent doses may worsen hypertension. Ingredients: Licorice Root, Structured Water, 20% Alcohol. Non-Alcohol: Licorice Root, Structured Water, and Vegetable Glycerin. Contraindications: Pregnant women, diabetics and those with high blood pressure should avoid this herb. People suffering from heart disease should not use Licorice unless under a physician's care. According to the German Commission E monograph, Licorice supplements are contraindicated in people with liver and kidney disorders, and thus, people with kidney disease, gallbladder disease, and cirrhosis should avoid this herb. Large doses of Licorice may induce sodium retention and potassium depletion and can lead to hypertension and edema. Use of Licorice should be done under the supervision of a healthcare provider or qualified practitioner. The herb is not meant for long-term use and should not be taken for more than seven days in a row. Long-term intake of products containing more than one gram of glycyrrhizin (the amount in approximately ten grams of the root, which is far in excess of the daily dosage recommended by this product) is the usual amount required to cause these types of effects. Do not take Licorice without speaking with your physician if you take potassium, laxatives, the heart medication, Digoxin (Lanoxicaps®, Lanoxin®, Lanoxin Pediatric®) or prescription diuretics (which may lead to loss of potassium, which may cause fatigue, muscle cramps, headaches, swelling, increase urination, breathlessness or high blood pressure). Other possible drug interactions with any Licorice product include potentiation of anticoagulants and possible interference with hormonal therapy due to estrogenic activity of Licorice (including decreased testosterone and birth control pills).